Thomas Rosser (1779-1864) appears in the baptism register at Coychurch, Glamorgan on 28 February 1779 as the base son of Thomas Rosser and Cicil Evan. A Cecil Evan, spinster, married William Thomas, bachelor of Eglwysilan at Coychurch on December 15 1781 (Marriage Bond at National Library of Wales). Thomas Rosser was buried in Coychurch where he is shown on the 1861 census as an agricultural labourer but the abode on the burial register is given as Llanblethian. (Note that Rosser is often transcribed as Roper because most records of the time used the long s for the first character in 'ss'). Thomas' wife Catherine, also known as Kate (1789-1849) may have been Catherine Hopkin baptised in St Bride's Minor in 1789 and married in Llantrisant, Glamorgan on 12 May 1813 - but there are other possibilities. She was buried in Coychurch on 6 January 1849. "I give and bequeath to my brothers David and Thomas and my sister Anne the sum of money now due to me from Thomas Mathews of the Prince of Wales of Coychurch to be equally divided between them. And I give the remainder of my property of whatsoever kind to my father Thomas Rosser whom I appoint sole executor to this my last will and testament." One of the witnesses signed as Ann Mathew. Cecilia Rosser (1816- ) born Llantrisant, baptised 31 January 1816; not mentioned in Mary Rosser's will in 1854. 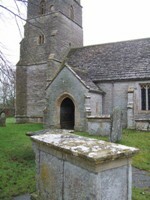 A Cecil Rosser age 20 was buried in Coychurch on 29 February 1836. David Rosser (1819-1906) born Llantrisant, baptised 9 April 1819; died Llanblethian; married Ann Hopkin (1817-1890; father David Hopkin) in Llansannor, 8 May 1841. Catherine Rosser (1846-1880) born Llansannor. Birth apparently unregistered. With parents as Cathrine, aged 4, in 1851 census. She married David Walter (1843-1903) in St Hilary on 11 July 1877 and had Albert Walter (1878-1943) and David Thomas Walter (1879- ) both baptised Peterstone-Super-Ely. See The Family of David Walter and Catherine Rosser. Mary Rosser (1848- ) born Llansannor. Nursemaid in the household of Sampson Hatt at Lansanwr Court in 1861. David Rosser Atkinson (1879-1941) married Gertrude Payson (1882-1935). On his Draft Registration completed in Portland, Oregon he was described as a Special Agent Fire Insurance for the Northern Assurance Co. of London; tall, stout with blue eyes and dark hair. They had Rosser Payson Atkinson (1907-1963) and David Carter Atkinson (1919-2006). Mary Ethel Atkinson married James Maurice Flack (1877-1952) described in his Draft Registration Card as a machinist for the Bethlehem Steel Co. in San Francisco. They had Ellen E Flack (1907-1998) and Dorothy Clare Flack (1913-2001). The San Francisco call November 8 1903 - Weddings. At the Howard Presbyterian Church Thursday evening. October 29, Mary Ethel Atkinson, daughter of George F. and Sarah Atkinson, was united in marriage to J. M. Flack, son of the late John Flack, who was connected with the Southern Pacific company for twenty-five years. The young couple went to Southern California to spend their honeymoon and on their return will reside at 2310 Folsom street. The wedding presents were costly and numerous. ATKINSON- in this city, September 20. 1904. Ellen Edith, beloved daughter of George F. and Sarah Atkinson, and sister of David R. and Fredrick H. Atkinson and Mrs. J. M. Flack, a native of San Francisco, Cal., aged 19 years 5 months' and 23 days. Friends are respectfully invited to attend the funeral service today (Thursday), at 1:30 o'clock p.m.. at the residence of her sister, Mrs. J. M. Flack, 2321 Folsoro street, between Twenty-fifth and Twenty- sixth. Interment private. Frederick Hartley Atkinson (1887-1918). On his Draft registration he was described as tall, slender with brown eyes and dark hair, employed by George F Atkinson as a wood turner. On his funeral home record he was shown as single, a wood turner, cause of death Pulmonary Tuberculosis. He was interred at Cypress Lawn Cemetery. Ann Rosser (1858- ) born in Llanblethian. With parents in the 1871 census. Sarah Rosser (1823- ) born in Llansannor. Christened in Coychurch on 18 March 1823. Not named in Mary Rosser's Will of 1854 so probably dead before then. Thomas Rosser (1826- ) born in Llansannor. Christened in Coychurch on 2 May 1826. Anne Rosser (1829- ) born in Llansannor. Christened in Coychurch on 12 April 1829. With her parents in 1841 aged 12. Living with David Rosser and Ann in 1881 were two grandchildren: Jane Rosser (4 February 1874 -1932) and Thomas Matthews aged one. The birth registration for Jane Rosser shows the mother as Ann Rosser of Forest, Llanblethian who registered the birth with no father's name (Bridgend District (March Q, 1874, Vol 11a, Page 551). 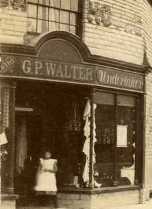 David was a widower in 1891 when Jane Rosser was the only other person at 'The Forest', Llanblethian. She was described as a general servant. Both were bilingual. On 10 June 1892 Jane married Aaron Parsons (1868-1942), a quarryman, at Pontypridd Registry Office. Jane's age was shown as 19 and she did not give a father's name. This suggests that she was the illegitimate daughter of one of David's daughters. Aaron and Jane were still living with David Rosser in 1901 along with three children: David Parsons (1893- ), Thomas James Parsons (1896- ) and William Henry Parsons (1899-1903). In the 1911 census, the family are shown as Parson, with Aron Parson (42), Jane Parson (38) having had 8 children of whom 4 were still alive: David John Parson (17), Thomas James Parson (14), Elizabeth Ann Parson (1901-1959) and Eleanor May Parson (1905- ). Jane spoke Welsh, Thomas spoke both Welsh and English, the others English only. In the 1939 Register Aaron is shown as a widowed Boiler Stoker OAP (old age pensioner) born 11 October 1868 living in Llantrisant with Elizabeth A Parsons born June 23 1901. With them was James Hewitt (10 Jan 1900-1970) who subsequently married Elizabeth Ann on 29 Sep 1942. There was a further individual whose record is officially closed.